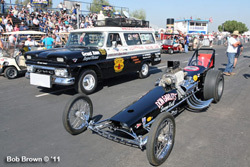 3:00 - 7:30 "Nitro Night"
Two dragsters (Swamp Rat III and the Fishbowl dragster) plus Ed "the Ace" McCulloch's '32 Victoria will be on display at front of InterContinental&REG; The Clement Monterey&REG; on Cannery Row. Nitro-themed food and drink specials will be available. Autograph session will be with attending members of International Drag Racing Hall of Fame and will take place in hotel courtyard overlooking Monterey Bay. The road course will be running all day Fri-Sun and they run a TIGHT schedule, so its important for us to be ready to roll at designated times for all Nitro Revival Activity. 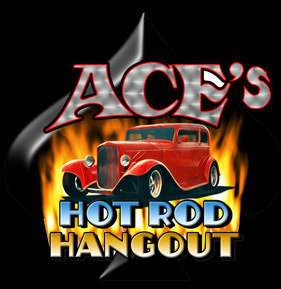 At-track activities: Ace's Hot Rod Hangout in paddock. 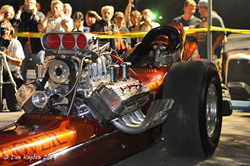 Nitro Revival Line of Fire 5:30pm-6:00pm...grand finale! Friday, May 18 on the famed Cannery Row in Monterey. On track photography is limited to approved media only. Will be much tighter than Barona. Entries Only: Overnight camping and motorhome parking available with your entry or admission. Food will be available at the track but we invite you to bring E-Z Ups, coolers, ice, your BBQ and your choice of beverages. You can participate in the second ever "Line of Fire," an in-unison fire-up at the end of Saturday's activities. Nitro will not be available at the track. Monterey has more non-racing things to do, pricy and safer. Salinas has a bigger mix of hotel/motels to choose from, and is less of a tourist spot. The track is just off a busy highway [Hwy 68] between Salinas [101 Freeway] and Monterey. Before or after the race, The Seventeen Mile Drive is something special while you're in the neighborhood.